Well, one of my favorite literary genres is Utopian Fiction. Actually one of my favorite novels, Islandia, is considered an underground classic of the genre. I’ve always been fascinated with writers trying to create a perfect society even though we human beings are not perfect. I bet God has a big, hearty laugh at our feeble attempts in trying to perfect something that he has created. However, we will try again and again. So I decided to read one of the classics of Western Literature, Utopia by Thomas More, to get a historical perspective on this genre. Utopia seemed more of a book of philosophy than a novel. And I felt let down by that. I love good stories and I don’t mind reading someone’s philosophy as long as it has characters, plot or storyline, and a theme. I will admit that Utopia had a theme but the characters and storyline left me wanting more. The main gist of the book is that the perfect country is described to the narrator by a sailor named Raphael. He describes Utopia as a nation in stark contrast to the nations of Europe around the 16th Century and it be held up as a model of how a nation should run and govern its people. Wealth and the Upper Class has basically been eliminated. Work and Goods have been equally distributed and property is owned by the nation and given out fairly. Religion is allowed but does not control the wealth or power structure of the nation. Uh-oh! That sounds like socialism or communism to you more politically-minded folks. And it probably is. However that debate can be written or talked about for another day. 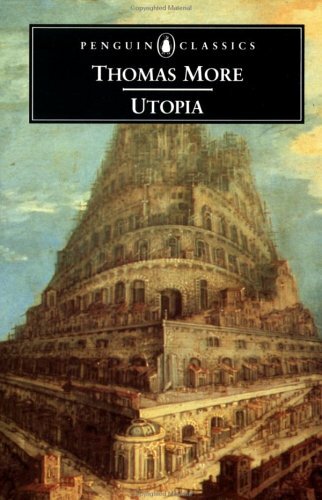 I thought Utopia was an interesting book to read and I could see its place as is the forefather to Utopian Fiction Genre. But as human beings with our flaws and imperfections, Utopias can be interesting works of imagination and sometimes good food for thought. And I can mark this book in my checklist of Western Classics that I have read.